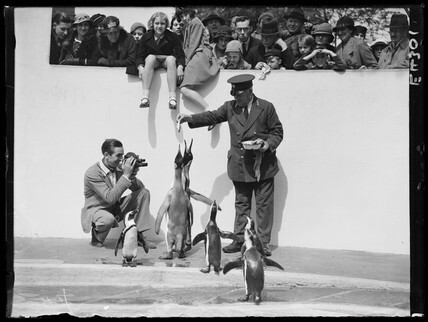 Walt Disney filming penguins at London Zoo, 1935. The penguins at London Zoo being fed by the keeper. Slum housing, South London, 7 September 1934. No 3 Court, Clayton St, Liverpool, 2 March 1933. Slum property in Liverpool, Merseyside, 2 March 1933. Boys fighting in the school playground, c 1930s. Father Christmas with a small child, 24 November 1936. Woman buying groceries, 24 June 1937.